Come Check Out Our Practice! We do quality work! We take pride in the personal attention and thorough patient education we provide to our patients and their families. Along with our amazing office setting, cleanliness, chic décor, and outstanding customer service, we use state-of-the-art digital X-rays to minimize X-ray exposure and to achieve the highest quality images. All the patient records are digitally stored using practice management systems running on Apple computers that are extremely reliable. We are committed to a team approach involving Dr. Murthy, our staff, our patients, their family, and our patients’ family dentist. Dr. Murthy constantly communicates with our patients’ dentists with letters, photos, and X-rays to keep the dentist updated on each patient’s treatment progress. We believe that good communication and understanding are the keys to an excellent working relationship with our patients. Our staff is prepared to answer your questions and to provide you with any information necessary throughout active treatment and into retention. Our treatment fee includes everything – your visits, records, orthodontic appliances, one set of retainers, and two years of post-orthodontic treatment visits for retention checks. There are no surprises. Patient video testimonials are available for viewing. In addition, select patients have volunteered to serve as references regarding our caring customer service and their orthodontic experience with us. Our staff and Dr. Murthy work as a well-balanced team so that together we can achieve your orthodontic goals. Each member of our staff is friendly, outgoing, caring, skillful, and knowledgeable. We are here to work with you and transform your smile! We see patients from age seven to age 70, and beyond. For young patients from ages seven to 12, we provide Phase I interceptive orthodontic treatment to monitor facial growth, dental development, and eruption of permanent teeth as the children grow into teen years. 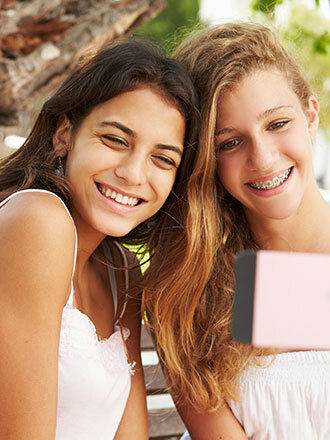 For adolescent patients from ages 13 to 19, we provide Phase II comprehensive orthodontic treatment giving them a healthy and beautiful smile. For adults, the treatment we provide ranges from simple procedures such as making spaces for crowns, bridges, and implants, to more complex surgical orthodontic treatment working closely with Boston’s top oral surgeons to correct jaw malocclusions. We are also happy to provide Invisalign® or clear aligner treatment to adults who meet the required indications.